Citluk is only 5km from Medjugorje and is known as the city of grapes and wine with over 4,000 inhabitants. Zilavaka and Blatina wines are it’s symbols. In Gradnici in the municipality of Citluk there is the oldest wine cellar in Bosnia and Herzegovina. It is built completely underground and now serves as a wine museum following reconstruction. Some wines are exhibited in the wine shop which is also part of the wine cellar. Mostar is 25km from Medjugorje, with the old Turkish town being the main attraction. 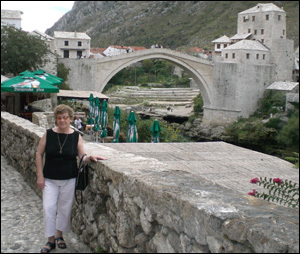 It is very compact and is ideal for a walking tour through the old town and across the old bridge (Stari Most). Mostar is situated in one of the most beautiful valleys on the Balkan peninsula and along the banks of the majestic and mighty Neretva River. The Old Bridge is a single-arch stone bridge and is an exact replica of the original bridge that stood for over 400 years but collapsed from tank shelling in 1993. The waterfalls are 14km from Medjugorje. The height of the falls is approximately 28m. They stretch over 100m across and tumble down 25m. Kravica is one of the largest waterfalls in Herzegovina and the most impressive. In summer time, the pool under the falls offer swimming enjoyment. In the summer season, there are many restaurants near the falls offering barbecue grill and fish specialities. Neum is 60km from Medjugorje and is situated on the Adriatic sea and is the only town of Herzegovina. It is a Mediterranean town and tourist attraction. This is a small town but well worth a visit to see the largest Karst spring in Europe and which gives rise to the river Bhuna. The river emerges from an underground stream after it has carved it's way through irregular limestone. It's beauty is really magnificent as the cold and green looking river rushes out of a cave beneath a towering cliff.